A San Francisco cyclist has developed a way to attach reflective fabric to a bicycle that turns the entire bike frame into a giant reflector for riding at night. 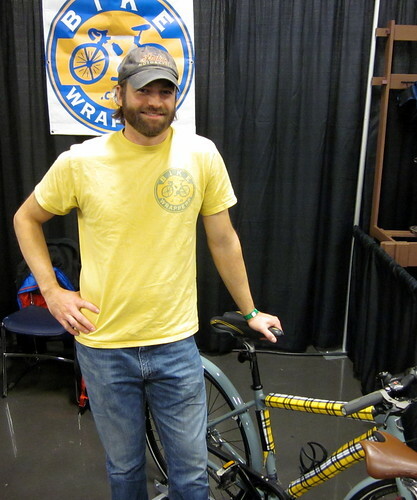 When I spoke with Brent Thomas (left) at the Seattle Bicycle Expo on Saturday, the former Internet marketer says he has a lot of ideas in his head. I'd say that Bike Wrappers is probably his best. The easily attachable fabric makes your bicycle highly reflective at night from all directions (see the video below). And that's how he came up with the idea for Bike Wrappers. Thomas found a silver fabric that's highly reflective. He added velcro so it can wrap around the frame tubes. It accommodates most frame sizes, as well as cables and bottle cages. There are no batteries and it doesn't use adhesive. You can change it from bike to bike in just a few seconds. To spice up the bike during the day, he made them reversible. He has 25 choices of patterns on the flip side, including black and white zebra stripes, polka dots, hot pink, plaid and more. If you ride at night, then you probably don't let rain stop you from riding either. Bike Wrappers are effective in wet weather, and when they get dirty, they can just be dropped in the washing machine. All in all, it sounds like a lightweight, durable, flexible solution to make your bike more visible at night. You can find more information at the Bike Wrappers website, where you also can order it.